Daniel Patrick Borden, 20, of Ohio, told the judge he was not a bigot and apologized to the city of Charlottesville, as well as beating victim DeAndre Harris, who was not in the courtroom. 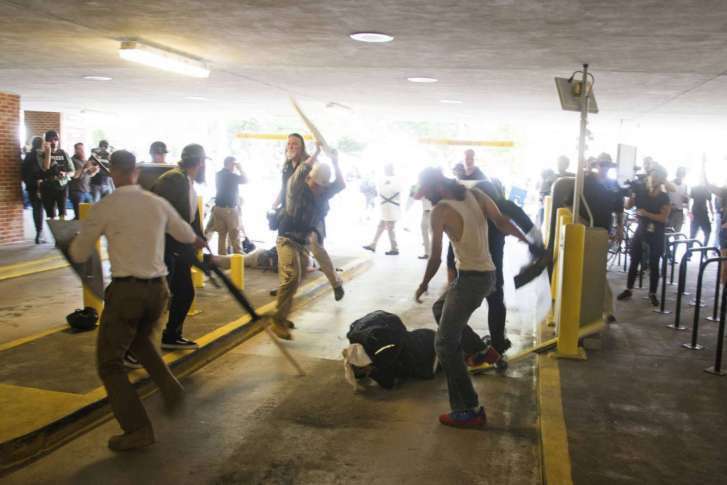 WASHINGTON — The judge sentencing a white man for the 2017 beating of black man in a Charlottesville, Virginia parking garage pointed to the videotape showing the beating of DeAndre Harris, and said it showed maliciousness. Daniel Patrick Borden, 20, of Ohio, will spend three years and 10 months in prison — Judge Richard Moore sentenced Borden to 20 years, but suspended much of the time. Borden told the judge he was not a bigot and apologized to the city of Charlottesville, as well as Harris, who was not in the courtroom. Borden was one of four men charged in the Aug. 12, 2017 beating of Harris, after the violent Unite The Right white nationalist rally, in which a counterprotester, Heather Heyer, was killed. Last year, Borden entered an Alford plea, in which he maintained his innocence, but acknowledged prosecutors had the evidence to find him guilty beyond a reasonable doubt. “They got their asses kicked multiple times,” Borden said in the video. In sentencing, Judge Moore said Borden was not at risk as he participated in the attack on Harris. Before sentencing, Borden’s parents testified on his behalf. “I absolutely do not think my son did anything wrong,” said Borden’s father Rick, a retired Air Force pilot. Borden’s mother, said her son had learning difficulties, and once he turned 18, he left home to live with his father, who allowed him to drop out of high school. In closing, Charlottesville prosecutor Nina-Alice Antony asked for a strict sentence, calling the attack savage. “It troubles the commonwealth that his family doesn’t think he did anything wrong,” Antony said. Two other men, Jacob Scott Goodwin and Alex Michael Ramos, were found guilty at trial and sentenced to eight and six years, respectively. Tyler Davis will go on trial in February.